Playing for Athletes in Action on a Moscow trip in 1989, Chad Silver met and befriended a young Soviet player named Andre Tselikovsky, according to Scripps Howard News Service. Tselikovsky had big baseball dreams and Silver helped him at least pursue them. Silver helped make a trip to the United States and Silver's Carson-Newman College team possible, the news service wrote. "Everybody likes him," Silver told Scripps Howard of Tselikovsky. "It's a wonderful adventure. I can't believe I'm involved in such an experience. (Andre) is the most highly motivated person I've ever met. I enjoy baseball a lot, but he's really hooked." While Tselikovsky never realized his dream of playing in the pros, Silver did realize his, though briefly. Silver went on from Carson-Newman to play in the Phillies system. His career consisted of a single season. Silver's career began and ended in 1990, taken by the Phillies in the 42nd round of the draft out of Carson-Newman in Tennessee. Silver is also credited as Chadwick Silvers. At Carson-Newman, Silver hit a two-run double in an April 1987 game. He later won second-team all-conference honors in 1990. Carson-Newman's baseball complex, the Silver Diamond Baseball Complex, is named for Silver's parents, whose donations helped build it. On the dedication day in May 1990, Silver hit a home run, according to the school. 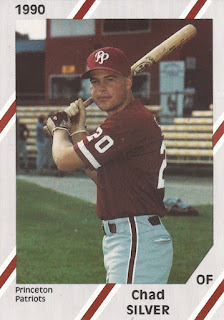 Silver played his season with the Phillies at rookie Princeton. In 47 games, he hit .234. He knocked in eight and stole four bases. Those numbers marked the extent of his career.